Poultry are exposed to a number of stress factors during transport, but problems with temperature stress could be the main threat. According to M.A. Mitchell and P.J. Kettlewell in a study entitled "Welfare of Poultry during Transport – a review produced for the Food and Agriculture Organisation of the United Nations", thermal challenges, both elevated thermal loads and cold stress, constitute the main threat to the birds’ welfare and survival. The researchers said that the effects of thermal stress may be made worse by extended withdrawal of food or water and by exposure to vibrations and accelerations. Existing pathologies and injuries may further compound the situation, they said. Whilst genetic selection in broiler chickens has resulted in major improvements in growth rates and production efficiency, these advances may also be associated with a reduced resistance to thermal stress, altered heat exchange capacity and muscle and cardiovascular pathologies. These path-physiological states may render the birds more susceptible to thermal stress and may form a part of the “transport stress” experienced by poultry and lead to increased mortalities during exposure to hostile thermal microenvironments in transit and contribute to the observed increase in transport mortalities seen during challenging meteorological conditions. 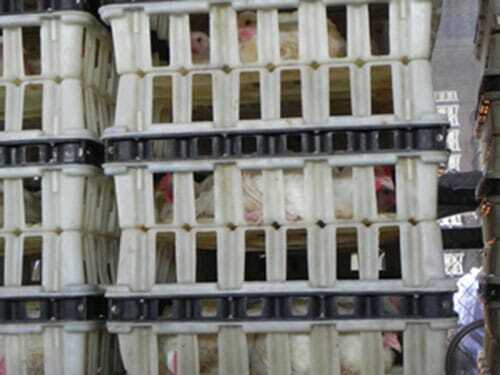 The research also shows that the major welfare and production problems associated with poultry transportation are mortality in transit, poor welfare associated with the transport thermal environment and stress induced pathologies and decreased muscle/meat quality in slaughter birds. The most likely reasons for these problems are poor vehicle and transport container design, poor control of the “on-board thermal micro-environment and inadequate ventilation and the physiological characteristics of the birds resulting from genetic selection for production traits. As in the next decade the demand for meat poultry and egg production is expected to expand further, and as all poultry species and major breeds in the main intensive production systems are transported at least twice during their lifetimes over distances that may range from a few kilometres to journeys with durations of many hours, the stresses of transportation are going to have an increased effect on the welfare of the birds. Most journeys are by road from hatchery to production site or from farm to processing plant but some birds may also be transported by air or sea. All modes of transport involve the placement of birds or chicks in to transport containers, which are subsequently loaded on to vehicles, aircraft or vessels for translocation to their intermediate of final destinations. 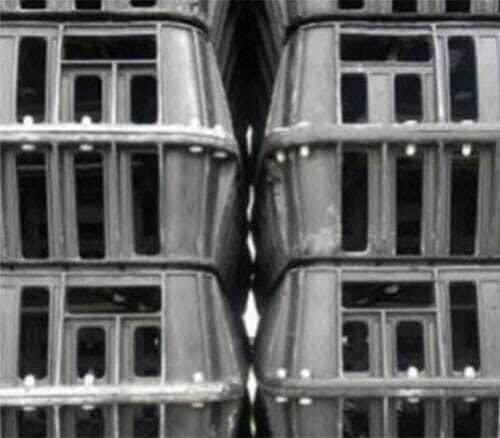 All the procedures and practices involved in transportation and the micro-environments prevailing in containers and vehicles may impose varying degrees of stress upon the birds, which will result in compromise of their welfare status, health and productive efficiency depending upon the magnitude of the challenges imposed. The major features and consequences of transportation stress are the appearance of thermal discomfort, which is a welfare issue, dehydration, weight loss, energy depletion and fatigue. Other problems include stress induced myopathy, vascular pathology, such as ecchymotic or punctate haemorrhage, blood gas and acid base disturbances, changes in electrolyte balance and distribution, tissue dysfunction and pathology, which may affect welfare status and product quality in slaughter birds, and finally injuries to birds resulting from stress induced behaviours in transit and catching methods, which may render birds more susceptible to other aspects of transport stress. The research says that the characteristics of modern breeds or strains of poultry may underlie a predisposition towards a susceptibility to transportation stress. This includes the fact that rapid growth rate appears to be associated with a higher basal metabolic rate and a reduced heat stress resistance. In heat stress, an increased metabolic rate and greater degree of hyperthermia may predispose modern lines to disruption of homeostatic systems, heat stroke, tissue damage and heat induced mortality in transit. The rapid growth rate appears also to be associated with an idiopathic myopathy that may predispose towards stress induced myopathy and a reduced heat stress resistance and the rapid growth rate also appears to be associated with a number of pathological conditions, such as pulmonary hypertension, which may render birds more susceptible to other aspects of transport stress. Some of the solutions and remedies that are available to reduce the detrimental effects upon the well-being, health and productivity of poultry in an economically viable modern poultry industry include improving the thermal environment of the vehicle and container design and improving passive ventilation systems focused upon enhanced passive airflow and better distribution within the “bio-load” may be adequate. The study says that in some circumstances active or mechanical ventilation systems are required to prevent or avoid thermal stress. It concludes that improved transport practices and procedures including changing stocking densities and transport scheduling and minimising journey durations will also prove beneficial. The Dutch based animal welfare organisation, Eyes on Animals recommends that the floor surface of the containers should be designed properly in order to allow ventilation during transport, to minimise the leakage of faeces and to be anti-slip. 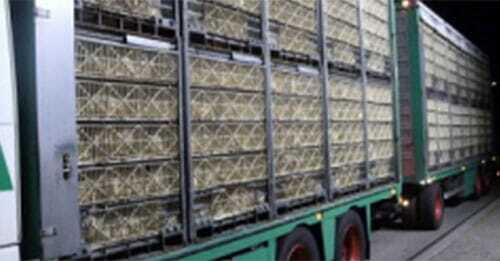 The organisation in a report, Cracks in the Crate Routine abuse of the EC 1/2005 legislation during the transport of chickens, by Pei HongYin and Lesley Moffat says that it is hard to find a balance between improving ventilation and reducing leakage. 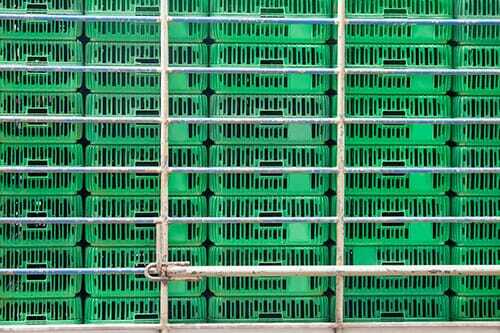 “However, we suggest that small ventilation gaps on the floor surface of containers can be adopted for both broilers and spent laying hens, which not only prevents the leakage but also allows some air flow during transport," the report says. Recently the Canadian Poultry Research Council (CPRC) co-funded a C$1.2 million project with a number of industry and government organisations in 2007 titled Engineering, animal welfare and meat quality considerations of broiler transportation in a heated and ventilated vehicle. The study reinforces the concerns that temperature and humidity levels in commercial transport vehicles are highly variable and can expose some or all of the birds to undue stress. Previous research at the University of Saskatchewan demonstrating this variability led to the development of a prototype broiler transport trailer with active heating and ventilation capable of much better environmental control than in the commercial trailers currently used. The purpose of the new CPRC project was to measure and compare differences in temperature and humidity between the prototype and commercial trailers in a range of environmental conditions typical of Canadian winters. The effects of temperature and humidity extremes on the welfare of the bird were also examined. The research was completed in 2012. Researchers found that extreme levels of temperature and moisture had an impact on bird well-being and meat quality. Mitigating these negative impacts will require strategies that avoid temperature extremes and remove excess moisture. Dr Crowe’s data suggests that supplemental heating may not be required, even on the coldest days. Results of the study were summarised in the CPRC Update in the January 2013 edition of Canadian Poultry Magazine. Dr Crowe is extending his research to turkeys as part of the Poultry Science Cluster, co-funded by industry and Agriculture and Agri-Food Canada’s Agri-Innovation Programme, part of Growing Forward 2, in a project titled "The influence of extreme temperature on turkey physiology, welfare and meat quality". The objective of this project is to investigate the effects of extreme exposure to temperature, age and gender, and transport duration on turkeys during simulated transport using the environmental test chamber located at the University of Saskatchewan Poultry Centre. The project was divided into two phases to allow the examination of both temperature extremes. The first phase investigates how turkeys respond to exposure to cold temperatures with controlled humidity. The second phase of the experiment explores the relationship between humidity and exposure to warm temperatures. To understand the impact of transport duration, the turkeys will be exposed to the test chamber for eight hours to replicate longer transport time. Feed withdrawal can also influence the results, as depriving turkeys the ability to consume feed during transport forces the birds to switch from an anabolic to a catabolic state, making the birds rely on the breakdown of tissues to meet their energy requirements. Results of this research will be made available to industry as data is collected, analysed and disseminated as part of the Poultry Research Cluster.